When you are on our "Checkout Page" Please verify that the shipping address is 100% accurate. Both FedEX and UPS charge for "Address Corrections", this charge is $7.00 for ground shipments, and $10.00 for 1st, 2nd, and 3rd day services. We will automatically charge you if we are charged an address correction and you will be notified by e-mail. Prices are for 1 item. $.15 per item will be added to your shipping charges for each additional item ordered. Alaska, Hawaii, and Puerto Rico: Will Ship Priority US Mail and there will be extra charges. For orders to Alaska, Hawaii, or Puerto Rico, or for United States Postal Delivery Please call our TOLL FREE number above. All of our products come with our 15 day money back guarantee. If you are not satisfied with your purchase please contact us for a return authorization. Upon receipt of your return, we will promptly issue a refund of the purchase price, minus a 15% restocking fee. Also, shipping and handling charges will not be refunded. Should you wish to cancel an order, once the order has been shipped, there will be a 15% restocking fee as well as the shipping charge for the carrier to return the product to us. Cancelled orders that have not yet shipped will receive a full refund. Food items such as Wise long term storage food are not returnable due to safety concerns for all of our customers. NOTE: Replacement parts, including filter media, replacement cartridges, etc., are not returnable. Merchandise must be returned to us within 30 days from the day you receive it, (Return authorization must be obtained within 15 days of receipt of the product based on carrier tracking information), in good condition, with the original packaging and paperwork. All Water filter products, including shower filters, Gravity systems, Distillers, Countertop and Under counter systems may be returned only if unused. NOTE: For obvious reasons refunds cannot be given on: 1) Gift Wrapping 2) All shipping and handling, including Overnight shipping, 2nd Day Air, International Shipping Charges etc. 3) Returned items that were shipped �FREE� will be refunded the amount you paid, less our normal shipping charges. 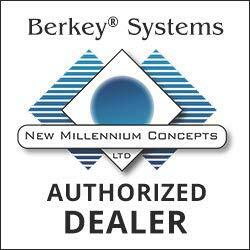 � 1996 - 2014 BerkeyWaterFilters.Com All Rights reserved.